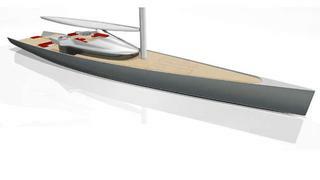 The 60m High Performance Cruiser was inspired by an overheard comment from a frustrated owner. The rapid evolution in sailing superyachts has proved that seaworthy, attractive and comfortable boats can be designed and built in almost any format: ultra-modern and sleek carbon racer-cruisers for the Mediterranean; deep-ocean, retro-classics capable of a circumnavigation; J Class throwbacks; a three-masted, square-rigged clipper; flying bridge, lifting-keel sloops, ketches or schooners that make small harbours and secluded, remote bays a destination option. Advances in technology and design have established that levels of comfort on board a sailing superyacht are comparable to those normally found on large motor yachts: internal volume, on-board entertainment, communications, climate control and an extensive inventory of toys are a prerequisite and sailing superyachts can now absorb almost any demand made by an owner in terms of comfort. However, just as the evolution and development of sailing superyachts appeared to be settling into a gentle progression, a new demand has to be met: performance. The introduction of superyacht regattas and bucket regattas provides an opportunity for big boat owners and crew to observe how yachts perform in competition and under fire. For many, the attraction is social; for others, the sheer spectacle of glamorous yachting hardware thundering around a race course is enough. For some owners, though, the racing demonstrates that their yacht is struggling against the opposition. One remedy is to hire or invite a professional, highly experienced after guard to improve results. However, there is the ultimate realisation that their yacht is simply not designed for performance. So is there a yacht available for these owners? Is there a superyacht that combines comfort and elegance without compromising on performance? 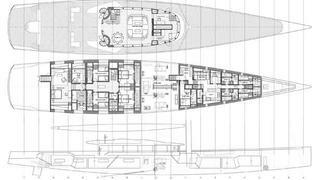 The answer may be found in the concept 60m High-Performance Cruiser (HPC60) – a collaboration between naval architects Donald L Blount and Associates (DLBA) of Chesapeake, Virginia; performance yacht designers Mills Design of Kilbride, Ireland; and the English marine interior designers Redman Whiteley Dixon. The trigger for the project was an informal conversation, explains Dr Robert Ranzenbach at DLBA. The initial challenge for the Anglo-Irish-American design triumvirate was to create a yacht with accommodation for an owner and eight guests in a high-performance hull. A rig, appendage package and sail plan would then be devised to compliment the hull. A further, crucial, design component was the drive to maximise the overall helming and sailing experience. For Mark Mills, head of Mills Design, the project was a blank canvas. Initial weight estimates, a target displacement and internal volume were targeted. ‘We wanted to establish what the minimum displacement was for that level of amenities,’ says Mills. To reach the targets and incorporate an interior that would be familiar on a 45m to 50m yacht produced a stretched hull to 54m at the water line, a narrowed beam of 11m and a displacement of 370 metric tonnes. To achieve the hull shape, the team studied and applied America’s Cup computational fluid dynamics (CFD) data producing a plumb bow and a fine entry with a broad, 7.1m long stern overhang: a combination that will supply a reduced wetted surface when the boat is upright in light airs, but increased overall length when heeled and fully powered. The design of the 70m rig was kept simple using high-modulus carbon with swept spreaders, non-overlapping jibs and a mast head, asymmetric spinnaker. Below the waterline, the keel and bulb exceed 70 tonnes and the 8m draught (5m with the keel raised) provide an impressive ballast ratio and righting moment potentially supplying stable and fast sailing.